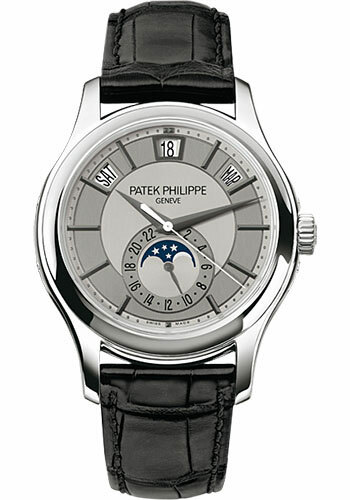 40mm 18K white gold case, sapphire crystal back, rhodium and silvery gray dial with gold applied hour markers, self winding caliber 324 S QA LU 24 H movement with day/date/month annual calendar with moon phase and a.m./p.m. indication, approximately 45 hour of power reserve, shiny black alligator strap with prong buckle. Water resistant to 30 meters. 40mm 18K white gold case, sapphire crystal back, matt black and slate gray dial with gold applied hour markers, self winding caliber 324 S QA LU 24 H movement with day/date/month annual calendar with moon phase and a.m./p.m. indication, approximately 45 hour of power reserve, matt blakc aligator strap with prong buckle. Water resistant to 30 meters. 40mm 18K rose gold case, sapphire crystal back, opaline white dial with gold applied numerals, self-winding Caliber 324 S QA LU 24H movement with annual calendar, day, date, month in apertures, moon phases and 24-hour dial, sweep seconds hand, approximately 35-45 hours of power reserve, hand-stitched matt dark brown alligator strap, prong buckle. Water resistant to 30 meters. 40mm 18K rose gold case, sapphire crystal back, black lacquered dial with gold applied numerals, self-winding Caliber 324 S QA LU 24H movement with annual calendar, day, date, month in apertures, moon phases and 24-hour dial, sweep seconds hand, approximately 35-45 hours of power reserve, hand-stitched shiny black alligator strap, prong buckle. Water resistant to 30 meters. 40.5 mm 18K white gold case, sapphire-crystal back, two-tone silvery dial with vertical satin-finish and blue transfer-printed indications, caliber 31-260 REG QA ultra-thin self-winding movement with annual calendar, day, date, month in apertures, regulator-style display (hour and seconds subdials, sweep minutes hand), approximately 38-48 hours of power reserve, shiny navy blue alligator strap with square scales, prong buckle. Water resistant to 30 m.